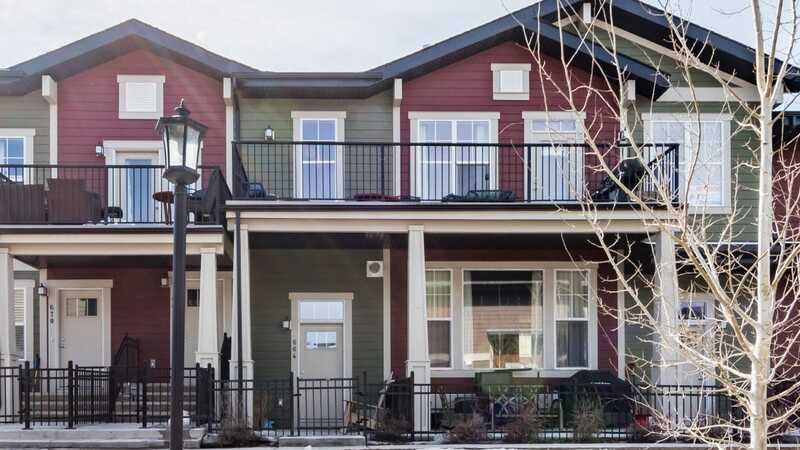 Harvest Mosaic stacked townhouse 3 bedroom Olive model with central air, gourmet kitchen upgrade with gas cooktop, slide-in oven, built in microwave/fan, side by side fridge with ice/water dispenser, dishwasher and granite countertops. Front loading high efficiency washer/dryer, 9’ ceilings, fireplace, bamboo flooring, tile bathrooms/stairway, upgraded carpet underlay in all bedrooms. Huge 25’ X 5′ balcony to enjoy the mountain view and using your gas hook up BBQ. Double car garage. Beautifully landscaped, garbage and snow removal included in condo fees. Located across the Deerfoot from Seton Shopping Centre where Cineplex will be opening soon! Seton Rec Centre will be completed in 2019 along with a new high school. Nearby elementary schools are Our Lady of the Rosary & Cranston Public, the middle school is Dr. George Stanley. Short walk to Fish Creek Park and its pathway system.